The social sector’s disinvestment in human capital continues unabated. Recently, GrantStation.com issued their Spring 2018 State of Grantseeking Report that identified the greatest challenge for nonprofits as a lack of time and staff. 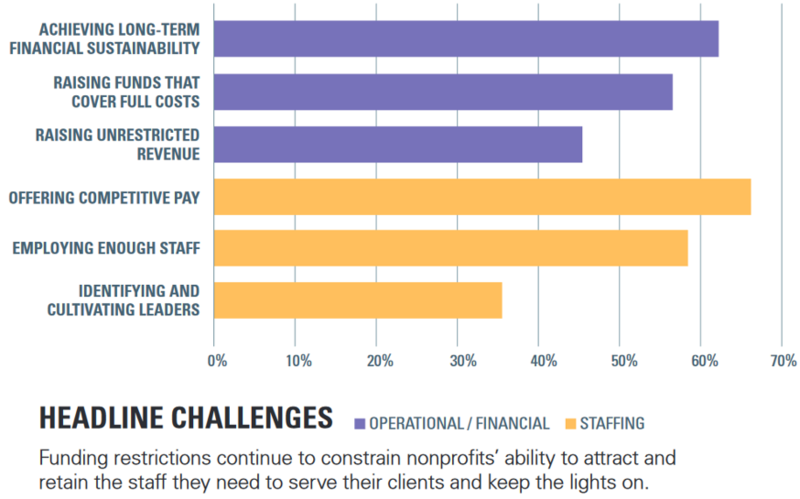 Likewise, Nonprofit Finance Fund’s 2018 State of the Nonprofit Sector survey highlighted the struggle nonprofits face in attracting and retaining staff. These reports are simply the latest in a long string of reports highlighting the same findings: the sector continues to disinvest in its people. GrantStation’s report revealed that when asked how their organizations control overhead costs, the most frequent response has been “Reduced number of staff,” followed by “Increased reliance on volunteers.” This year, 54 percent of respondents reported reducing staff, while 31 percent reported increased reliance on volunteers. Like any businesses, nonprofits can certainly find ways to boost productivity and increase organizational effectiveness. However, relying on exploiting the nonprofit workforce by overworking and underpaying employees is a fundamentally flawed model if we really want to drive social change. The question should not be “how” you are controlling overhead costs but “why” are you cutting overhead costs. Now the answer may seem obvious – funders don’t want to fund overhead – but the answer is actually more nuanced. Katie Tatham recently posed a great question on her Guidestar blog: “Why Is Overhead Expected in the For-Profit Sector, but a Punishable Offense for Nonprofits?” That is the real question. Back in March of this year, McDonalds announced they were tripling Tuition Assistance for restaurant employees and extending Career Online High School and College Advisory services to restaurant employees’ family members. The press release was accompanied by a series of new television ads hyping how McDonalds wants to be America’s best first job. McDonald’s was actually increasing its overhead costs. The result? Their stock increased from $156 a share before the announcement to $164 a share immediately following the announcement – an increase of more than $6.2 billion in their market value. Investors and business leaders understand the need to invest in their people and human capital. Read Forbes, Harvard Business Review or Inc. magazines and you will find a trove of articles that make the case for investing in your people – Grow Your People, Grow Your Business they all shout. Yet in the social sector, for-purpose businesses (a.k.a. nonprofits) are expected to minimize investments in staff, capacity, systems, and infrastructure to keep overhead rates low. This is completely nonsensical and flawed thinking. Do you ask Starbucks what is their overhead rate? Do you decide which new smart phone to get based on which company spends the least on sales and marketing? Is your decision to purchase the new flat screen TV in time for football season influenced by how much the company’s CEO makes? Of course not! For-purpose businesses, just like for-profit businesses, need to grow their people if they want to grow their impact. If we want to address complex, multi-dimensional, and entrenched problems like poverty, homelessness, economic and social inequity, then we need to build organizations that have the best people with the best systems and tools, as well as the financial resources to invest in innovation, scale and infrastructure. Like I have said before, if the social challenge nonprofits are working to solve is not going away tomorrow, then the nonprofit needs to be here the day after tomorrow and the day after that. This continued disinvestment in people and human capital leads directly to fewer people served, weaker organizations, and less resilient communities – and it ultimately perpetuates economic and social inequity. We must change our thinking. We must change how we even talk about these issues. And if we really want to drive positive social change, we need to start asking the right question. There is a famous quote that imagines a conversation between a CFO and a CEO. The CFO asks, “What happens if we invest in developing our people and they leave?” and the CEO responds, “What happens if we don’t, and they stay?” If you want the right answer, you need to ask the right question. Previous post The Year of Thinking Money First! Next post SQUIRREL!